Someone asks me about Ezra recently, one of the stocks that I recommend to sell at 1.50. I do said that this stock is in my radar. And recently this slide does makes the wait worthwhile. 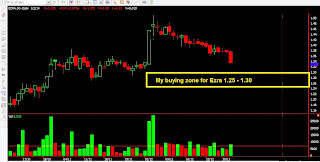 Ezra has a buying zone at this area 1.25-1.30. Let us see if it reach. If it reach and stand above 1.30 for the whole candle, the trend has stopped. Wish Everybody a Wonderful wonderful 2014! HSI set for a rebound between 21500-22000? Dow drops near 200 points again in 2 days! STI is giving a big discount to buy in!